Which left me with the idea that direct disk access is still possible (even after running that command) . Surely you do realize the difference between formulating hypotheses as part of an ongoing investigation where you have yet to figure exactly how to address a behaviour you're observing, vs. eliminating said hypotheses as you are zeroing on the most likely explanation. In other words, whenever you see something that seems contradictory as part of an investigation, it's obviously the concluding/most recent statement that needs to be taken into account. As you may also expect, disconnecting and reconnecting the device on the same platform is one of the first thing I tried, but that was to no avail after it had gone through an IOCTL_DISK_CREATE_DISK cycle. Maybe, as you suspect, this is due to Windows keeping a record of the device somewhere, or maybe it's something else. At any rate, I'd encourage people who are interested to play with the steps I provided (that's why I provide them), to try to shed some more light on the issue. And Rufus 2.10 has now been released. Please visit https://rufus.akeo.ie for the downloads. There is now BETA 2 here, to add a workaround for USB ↔ SATA controllers that report short writes for >1TB HDDs. More features to add, more bugs to fix... you know the drill. It's therefore time for Rufus 2.12 BETA! As usual, if you think that there's something off with the BETA, the issue tracker is at your service. Rufus 2.12 has now been released. The Changelog is the same as above. Of note, with regards to the upcoming Windows 10 Creators, which none of the articles listing new functionality seem to be bringing up, is that it looks like this version of Windows will be the first to enable mounting and accessing multiple partitions from the same REMOVABLE drive. Anyway, the download for Rufus 2.13 BETA can be found here. As usual, please don't hesitate to report if you think you found an oddity with this release. The good MS guys must have found some old system where cfadisk.sys was installed and liked it . They may not be formatted, but they do take up a drive letter in Explorer (my Chrome stick is given two drive letters) - but the drive letters are NOT shown in diskmgmt.msc !!! It also causes diskmgmt.msc to crash if you remove a Removable USB stick and refresh, and muck about a bit! Also, a standard E2B USB Removable drive has a small hidden partition (Type 21). This is now not hidden to Windows and it wants to format it! If you do format it, it is given a drive letter in Explorer (but not in Diskmgmt.msc!). 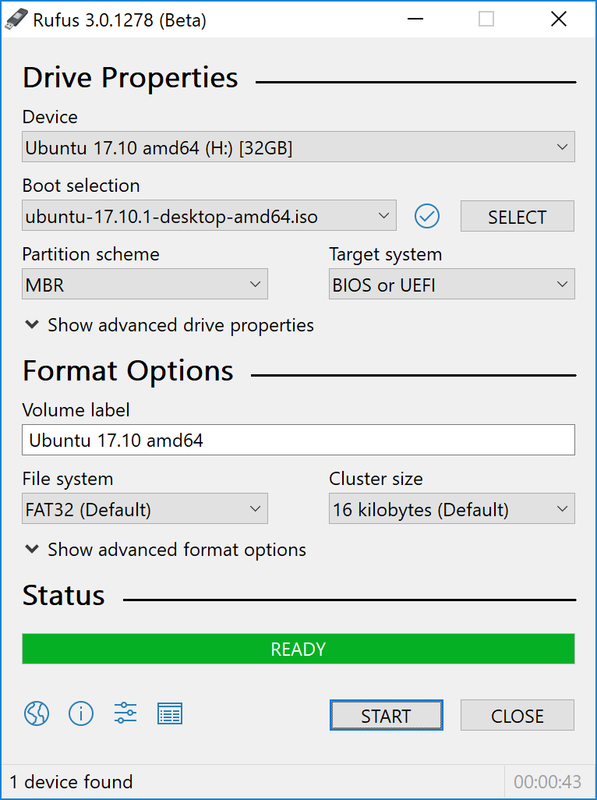 Even if you re-fresh or rescan diskmgmt.msc or refresh, the second partition is shown as 'Unallocated' even though it has a drive letter and I can copy files to it in Explorer! Seems pretty broken to me! And Rufus 2.13 has now been released. I would have liked to wait a little longer between BETA and Release, but since Microsoft actually started delivering the Windows 10 1703 (Creators Update) yesterday, for people who really want it, and I'd rather not have Rufus users run into the partition locking issue, I don't think I have a choice. The only difference with the BETA Changelog is that GRUB 2.0 was updated from 2.02~beta3 to 2.02~rc2. Had to release a BETA #2, since there were a couple issues reported that I wanted to address (which led to further internal changes that I want to make sure get a chance to be tested on as many environments as possible before release). As usual, if you try BETA #2 and see something that seems quite off, especially compared to earlier releases, don't be afraid to log an issue to let me know. Thanks! Isn't the Kali Linux's Rock Ridge extensions use fully detailed in the documentation on display (together with the plans)? is seemingly a friendly peep , but - at least at the time, around two years ago - he didn't seem like very "rigorous" in his approach (with no offence intended of course, everyone has to start somewhere). passed to the commandline application into the ISO itself. Still, Thomas is a nice guy indeed, and I was wrong when I said the xorriso people were pulling extensions out of... somewhere. What they did should not have been causing issues with software that follows the Rock Ridge specs, as those specs state that unknown extensions should be just be ignored (which they weren't). It also appears that Kali might still be doing some weird/non-compliant stuff on their ISOs, but that's another story. Yep, it seems even too good to be true. Most probably - also in this case - Thomas is perfectly innocent , that mkisofs feature wasn't among the most "reknown" ones, and (as cdob noted in the given thread) some developers (for mysterious reasons) already had the habit to post-edit the built .iso's with mkisofs to remove that piece of info. Thomas has started developing xorriso at a time when (for some other mysterious reasons) genisoimage was largely in use. Waiter come taste the soup! Rufus 2.16 has been released! IMPORTANT: THIS WILL BE THE LAST RELEASE TO SUPPORT WINDOWS XP AND WINDOWS VISTA. FUTURE RUFUS RELEASES WILL *NO LONGER* BE COMPATIBLE WITH THESE PLATFORMS. THIS IS THE LAST RELEASE TO SUPPORT WINDOWS XP AND WINDOWS VISTA. FUTURE RUFUS RELEASES WILL NO LONGER BE COMPATIBLE WITH THESE PLATFORMS. Well, it's been a long time coming, but at last Rufus 3.0 BETA is here! I guess I should point out that this new UI redesign is not something we did for the sake of looking for something shiny to add, but because we got countless reports that the old UI was very confusing (for one thing, image selection was way too far down the list of controls), nay daunting for unfamiliar users, and we've pretty much been wanting to improve on this for the past 5 years! I really hope this new modern design, the concept of which we really have to thank Fahad Al-Riyami for, will make Rufus both more intuitive and more user-friendly. Oh, and if you want to get an idea of how much effort is needed for something as seemingly innocuous as updating an UI, look no further than here, which also explains why so much time elapsed between this upcoming release and the last... On a regular release, the number of "small" items you'd see on this list would be less than 30 whereas this one has more than 200! Finally, it needs to be pointed out that, since I'm still chasing after translators, not all translations have been updated for the new UI. As usual, because this is a BETA, I would greatly appreciate if you use the github issue tracker to report things that seem out of place or don't behave as expected, especially compared to Rufus 2.18.